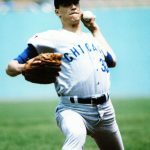 The Chicago Cubs’ Ken Holtzman threw the second of his two no-hitters, 45 years ago today. On June 3, 1971, Holtzman no-hit the Cincinnati Reds for a 1-0 victory at Riverfront Stadium. That followed an August 19, 1969 no-no in which he failed to record a single strikeout. In that game, Holtzman no-hit the Atlanta Braves at Wrigley Field for a 3-0 win.